Today scarcely anywhere on land or sea remains unexplored, but we are still largely in the dark about what lies beneath the surface of the earth. For thousands of years, writers and artists have imagined hell to be located somewhere in this underground realm, associating it with fire and shadows, blackness and death. Why Hell Stinks of Sulfur takes the mythology of this subterranean world as its point of departure and leads the reader on an expedition into the depths of the earth, treading in the footsteps of Orpheus and Odysseus, taking us through the circles of Dante’s Inferno and pausing at the side of a lake near Naples in search of hell’s gate as it was described by Virgil in the Aeneid. This journey towards the earth’s core, imagined by so many, from Homer to Leonardo to Jules Verne, would be more than 6,000 km long, a distance comparable to that between Paris and New York. Turning a scientific spotlight on the legends of the underworld, this book probes the many layers of the earth’s interior one by one, allowing mythology and geology to shed light on each other. It describes the variety of gases, ores, liquids and metals that lie beneath our feet in caves, mines, boreholes and geysers, revealing that this underground ecosystem is a unique archive of information that can teach us much about our ancient planet, whose riches we can still barely guess at. 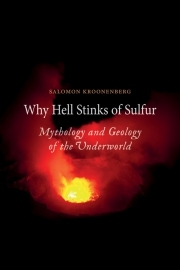 Why Hell Stinks of Sulfur is a fascinating quest into the infernal depths, uniting the scientific, the literary and the artistic, and at the same time an appeal to prevent humankind’s thirst for natural resources from exhausting the earth. Salomon Kroonenberg is Emeritus Professor of Geology at the University of Delft. He is the author of The Human Scale, which was awarded the Eureka Prize in 2007 for best non-specialist scientific literature.